I love soups and chilis in the winter. And I love recipes that don’t require much time to make, use minimal ingredients, and taste great. 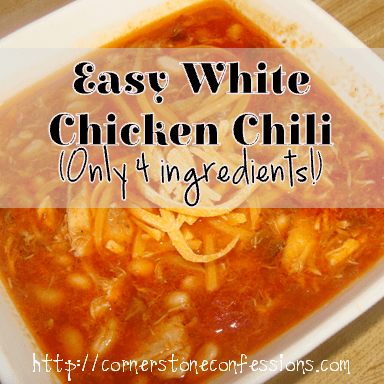 This chicken chili recipe meets all those standards and more with only 4 ingredients, minimal prep time, and crock pot friendly option. That said, I’ve also been known to not wait the hour but serve it up as soon as it boils and it still tastes great. Serve it alone or with cheese and tortilla chips. Either way it’s all yummy! Mix together and simmer for an hour or place in crock pot on low for 4 hours. Garnish with shredded cheese. Makes 8-1 cup servings.